Chairman of the Presidential Advisory Committee Against Corruption (PACAC), Itse Sagay has said the man who blew the whistle on the N13bn found in an Ikoyi Apartment in April is not "sufficiently stable" to handle his reward - a sum of N860m. 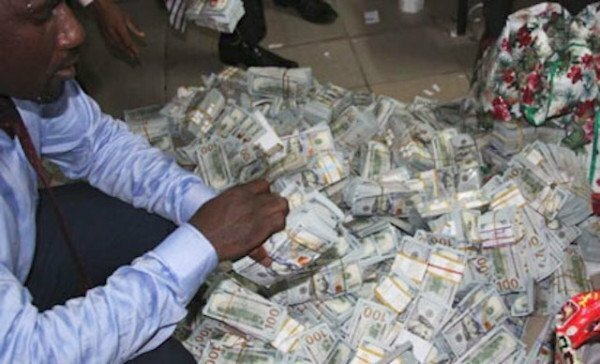 In April, the unknown whistleblower has tipped the EFCC of the money stashed in the apartment located in Osborne Towers, Ikoyi, Lagos, which prompted the agency to scoop and found cash in different currencies in the apartment. The money recovered were $43 million, 27,000 pounds, and N23 million. The apartment was bought by the wife of the former director-general of the National Intelligence Agency (NIA). The whistleblower's lawyer had raised an alarm about the non-payment of his client reward, and in reply, Sagay assured that the Governement was only taking measures by providing him with counsellors and consultants to ensure he was in a right frame of mind, else he might go mental. Sagay, speaking to PUNCH, said: "What I gathered from my enquiry is that the man is not sufficiently stable to receive such sum of money. He is like someone who will almost run mental when he gets the money and will use it in an irresponsible manner, attracting not only undesirable people but even danger to himself." "I think what they wanted to do for him to provide counsellors. Not just counsellors for character and mental situation but counsellors who would be like consultants that would help him to really invest the money and plan in such a way that he doesn't throw it away in five minutes." "They are trying to help him, but he just misunderstands the intention and like everyone that has been deprived for a long time, he is so desperate to have it but from what I can see, if they just give him everything, it wont last more than a month or two because so many people will start finding ways to get to him and taking their portions from him. So they are just trying to help him but he became hysterical."